Here is milady Cassandra (mka Cassie) modelling our first official Gold Key garb! 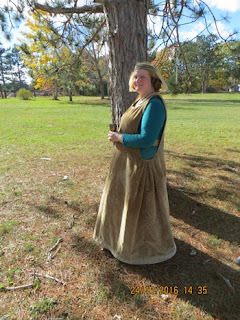 This sideless surcoat has a very long adjustable belt; the head-dress is also adjustable (yay safety pins) to fit a variety of sizes. The surcoat itself also ought to fit a good variety of sizes. Freydis was able to sew it up quite quickly, since it doesn't involve any sleeves and involves minimal hand-sewing. 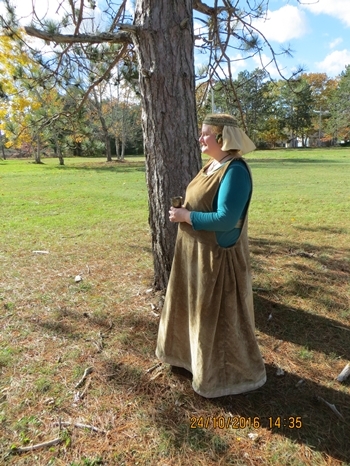 Actually, the surcoat might be a good beginner's garb project for anyone nervous about sewing, because the most complicated part is pleating the sides, and even that is pretty straightforward. In three pieces (surcoat, matching belt, and headpiece, all labelled "Ravensdale" inside), all the borrower needs to supply is a long-sleeved, collarless shirt in an appropriate colour. Her hair here, which is shoulder-length (a bit lower when the curls are stretched out straight) is simply done up in two loops on either side of her head. Basically, the hair on each side is loosely twisted together (twisting towards her face), an elastic is put near the end, and a bobby pin hooks onto the elastic and secures the end above the ear, under the hair coming down into it. If her hair had been longer we would have braided it; this also works fine. It's a very period hair style that works very well with shorter hair. It's a great look on her! A bit hot, though, being an upholstery velvet originally meant for a cloak (since relegated to my discard pile when the cloak didn't work out); but at least it will be warm in winter, and is also washable (ideally on delicates, and dried on low heat) and should be reasonably sturdy. Side view, to show the back of the headdress. You can just get a glimpse of the belt in this shot. It's hard to see, but it's made of the same slightly-lighter green velvet as the band on the bottom of the dress, and bordered, top and bottom, by the same trim that divides the two velvets at the hem, and is also around the neck.